Here is another WNTW video. 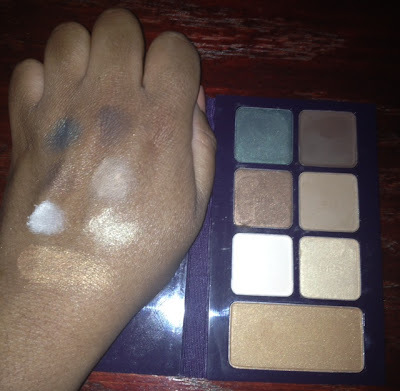 In this video you will see the swatches of the Inglot eyeshadows I showed you in my Black Friday haul video. 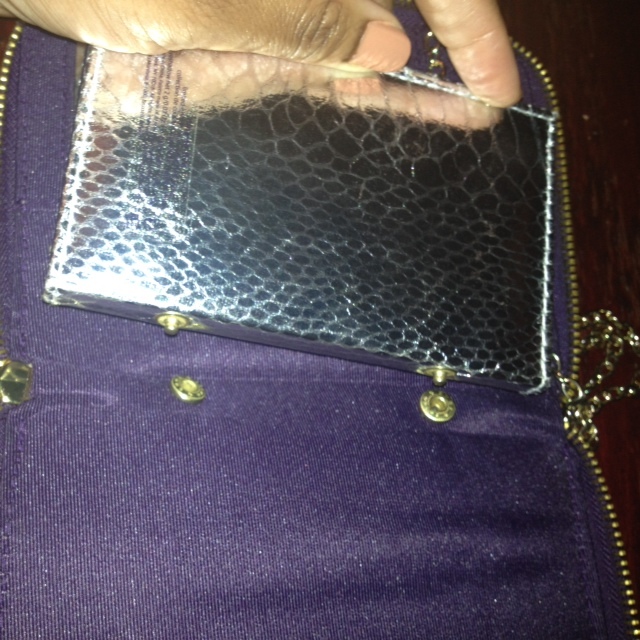 I will also show two new hair products that I purchased from Naturalista Cosmetics and my new Butter London polishes. The video starts off with my new darling shoes from Dsw. Thanks for watching and for your support of my blog and youtube channel throughout 2011. In this video I reviewed three masques from Whole Truth Solutions , a company known for creating soaps. 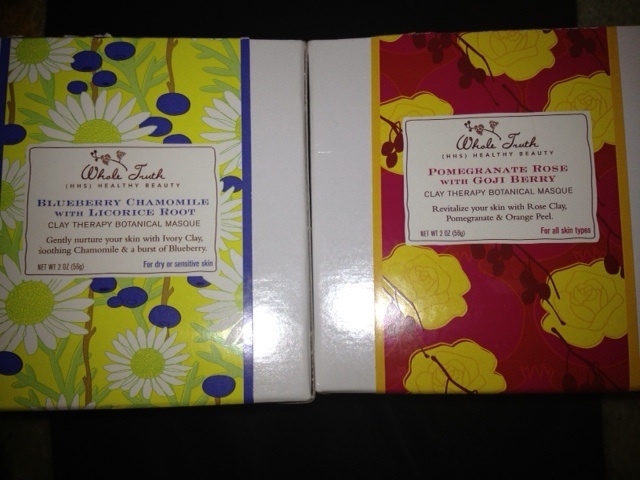 Now that they have stepped into the world of masques I was eager to get my hands on a few of them. If you look at the "clay therapy" section on their website, you will see that they offer 5 different masques. Based on your skin type, you can select the masque that will work best for you. I received Blueberry Chamomile and Pomegranate Rose from Whole Truth Solutions. 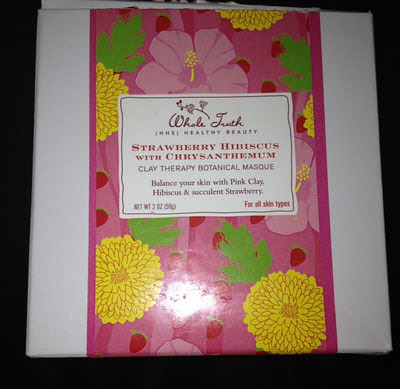 After trying out the masques I purchased Strawberry Hibiscus with Chrysanthemum on my own. The masques are generally $12 but they are on sale for $10.50 right now. As mentioned in the video, these natural dry masques just need water and then you can mix it up and apply it to your skin. I have sensitive combination skin and these masques worked well for me. Please check out the video for more info. Thanks for reading and enjoy your weekend. 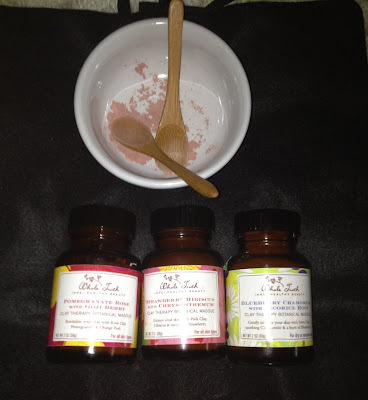 Here are a few products that I picked up as well as a review of the Aslilii Amala red raspberry hair mask. 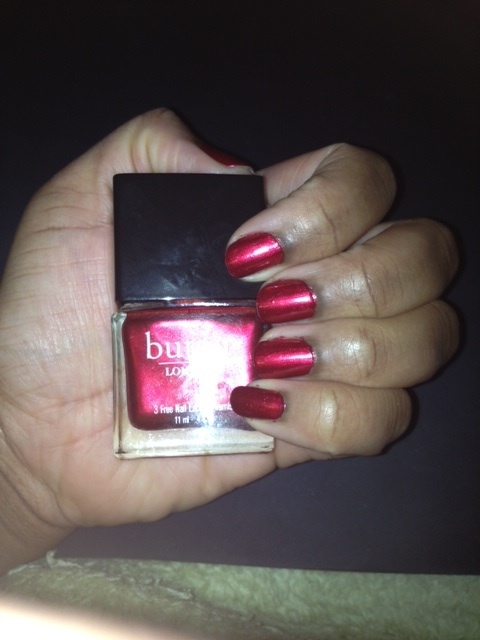 For years I have been saying that red just isn't my color but alas, I have found the PERFECT red nail polish. Knees Up by Butter London priced at $14.00, is a brilliant metallic red. This picture does not really do it justice, but this is the best my camera could do in this lighting. You can certainly make this a one coat application but in the pictures below I have on two coats. 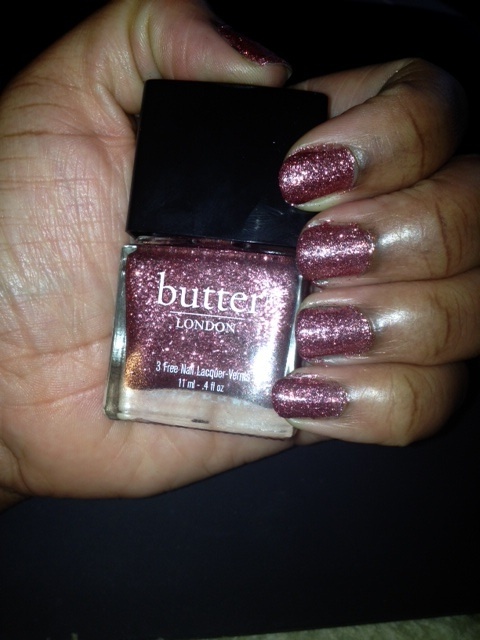 I am not wearing a top coat and this polish shines on its own. Much like Zoya, Butter London polishes are free of carcinogens. 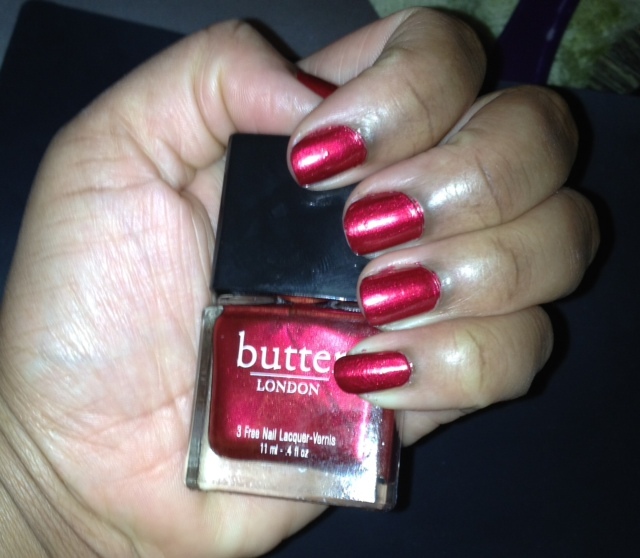 Today I am rocking "Rosie Lee" from Butter London. Their polishes are priced at $14 but I got it during Black Friday so I did get a small discount. This company is 3 free which means it is free of Formaldehyde, Toluene and DBP. 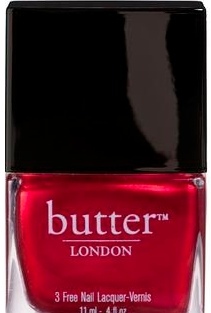 This polish is free of carcinogens! Yes, this polish is in the darker side of the pink family and although I always say I don't like pink, I couldn't resist this one! It took two to three coats to achieve this look and I am not wearing a top coat. Dooney and Bourke is on day 3 of their 12 days of saving program. Each day different bags are revealed to be on the list of discounted items, some items up to 50% off. Here is the link to day 3 the sale is only valid for 1 day until midnight while supplies last so shop early. I feel like I am rolling the dice because I keep waiting thinking that may favorite bag will appear but what if it doesn't? There are other bags that I can get but I don't want to end up with too many items at the end of 12 days...and so I wait...lol. 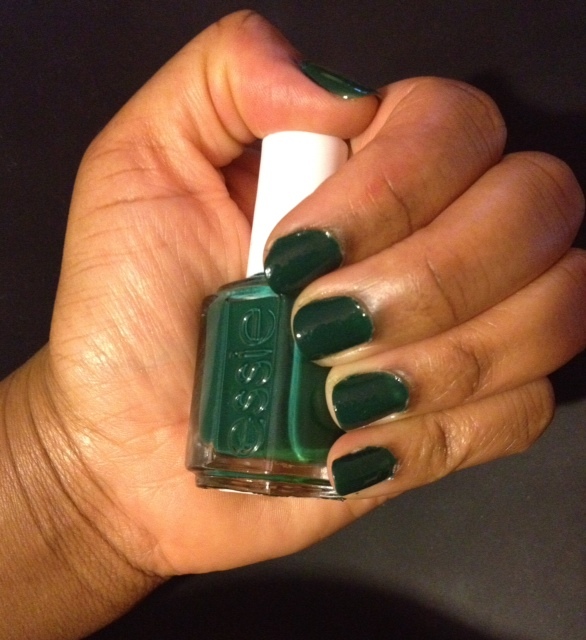 For my NOTW photo I am wearing "Going Incognito" by Essie. I think I am going to start a new series NOTW (nails of the week) where I showcase a simple pic of the nail polish I am rocking for the week. I will likely have more than one pic per week. I think it will help me to stop using the same colors over and over again. It should force me to begin to dig deeper into my nail polish stash. 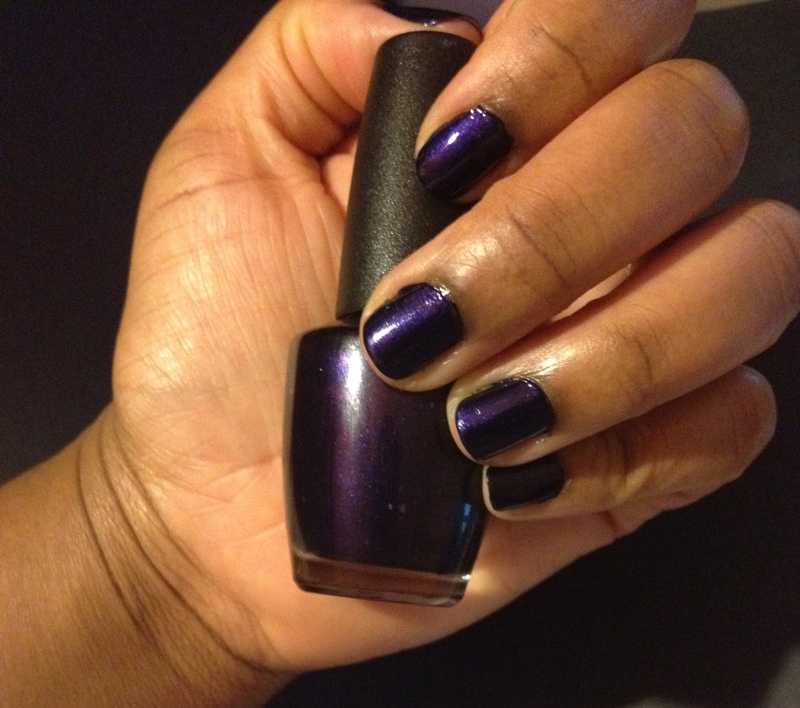 So this week I am rocking "Russian Navy" by OPI. What are you rocking this week? Here is the final What's New This Week video which features skincare items and hair items that I purchased recently. 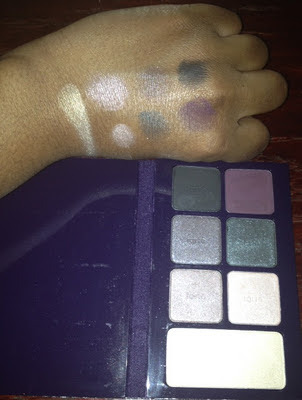 Here are just a few more items that I have swatched for your viewing pleasure. This video features Inglot and Nars. Thanks for watching and for supporting by blog and youtube channel (productjunkidiva). CLick this link to see what Inglot sales will happen this weekend. Perhaps you will see something in this video that you would like to pick up on Black Friday. 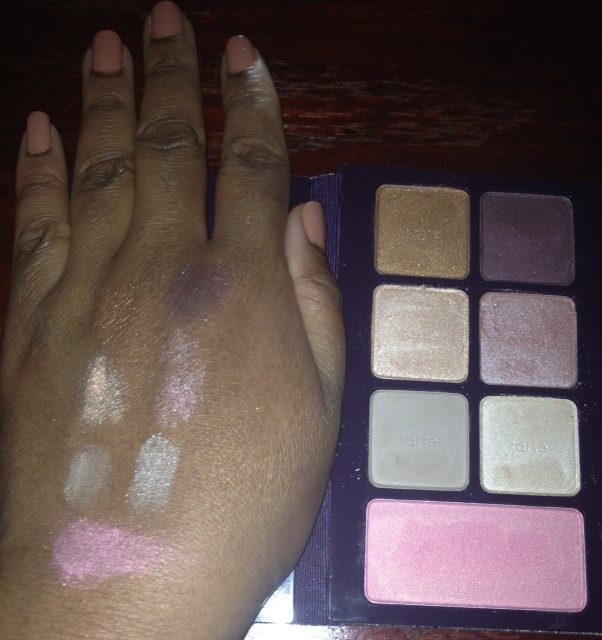 Check out my new polishes from Oyin, Zoya and my $39 Stilla eyeshadow palette. 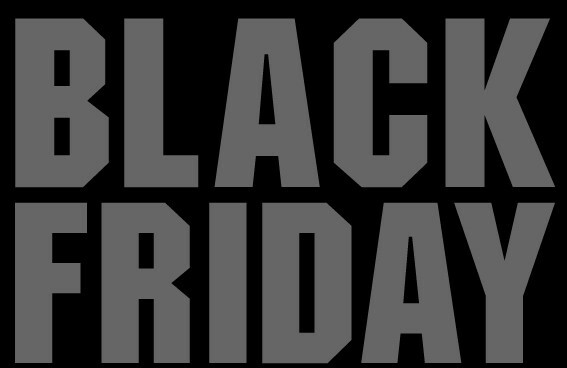 As always, I will maintain a list of Black Friday - Cyber Monday sales ...HOORAY. Please use the comment section to post any sales that you know of too. Sale starts at midnight EST, November 25 and ends at Midnight EST, November 29. That’s right, you have FOUR days to take advantage of our Black Friday sale! Our flagship store will be open on Black Friday 3-8pm and Saturday 12-7pm. Take 10% off all purchases on both days! ** It also looks like the Sugar Berry Pomade is back for Black Friday. Jane Carter- CYBER MONDAY- free shipping on all orders over $50. Sultra.com get $100 off the PINK flat iron from Nov 21-Nov 28th. Check out my review of it here. Miss Jessies - the anual BOGO sale--buy one get one free Now- December 31st. Puma sneakers 30% off your entire order Nov- 24th- nov 27th. Aerosoles take an extra 20% off your entire purchase. In STORE Only at this point. Newport News- they seems to have a variety of discounts. Bath and Body Works- they are giving away VIP bags filled with goodies if you spend $40 or more. Also they have other items on sale- click the link to find out. The Body Shop- 3 items for $30, you can also get a tote with select items included in the tote. Glo is offering Black Friday savings up to $50 off!!! 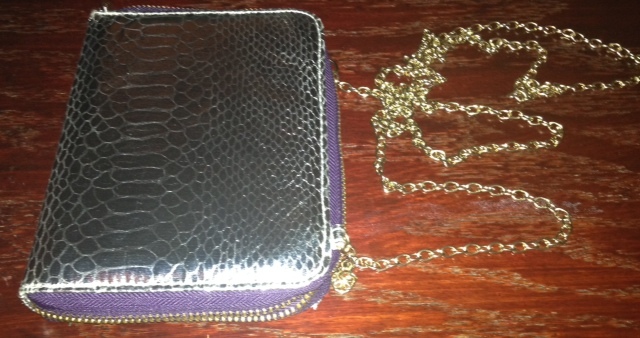 Dooney & Bourke (select outlet stores only) 50% off retail prince from Back Friday- January 2nd. Inglot Cosmetics will give you 15% off all online orders (Nov 25th at 3am ESt- Nov 28th) online...however if you go to Inglot boutiques you will get 30% off on Nov 25th ONLY from 8am -1pm. . (I learned about the in store discount by going to Milly's blog) I don't know about you but I will take the 15% discount and stay at home :-) . Black Up Cosmetics- it's not really a deal of sorts, but they will give you a free cosmetics bag with any order. They don't say that anything will be in the bag so I will assume it's empty. Elf cosmetics- free shipping on items over $30 and 50% off. 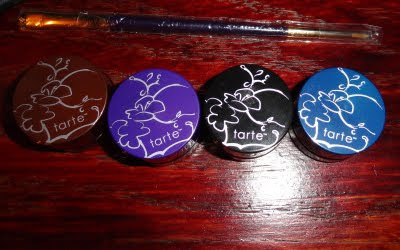 Tarte cosmetics- use the code CYBER you will also get a full size gift with each order. Be sure to click the link to see what you will save!!! A Transitioning Kit- Have you tried this? 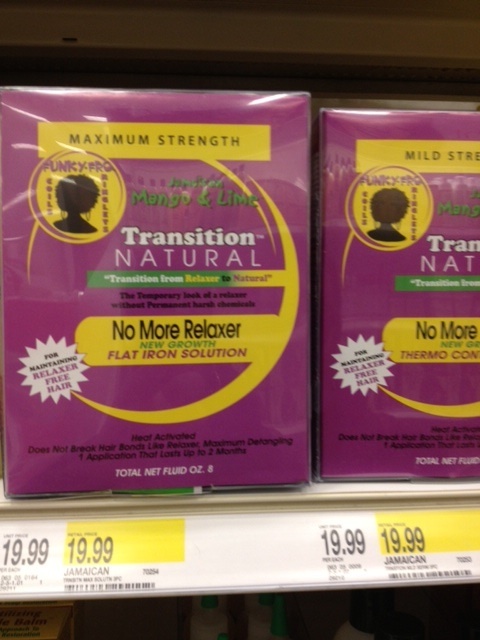 So I was enjoying my stroll through Target when I spotted a transitioning kit from the company Jamaican Mango & Lime. 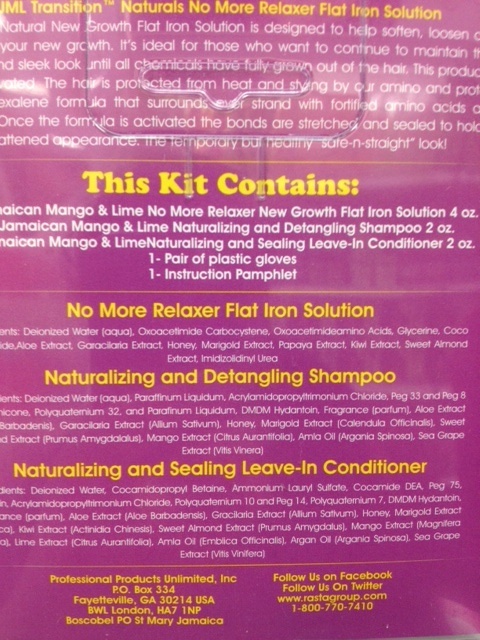 In large print you can see the text "No More Relaxer" so I was obviously intrigued. 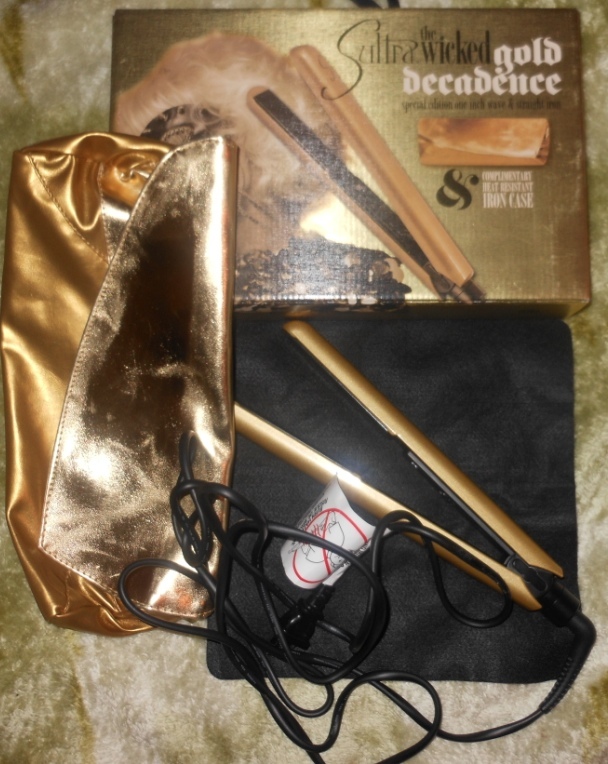 The kit which is pictured below claims that it can help to prevent a woman from doing the big chop by straightening the new growth to blend in with the relaxed hair. I know, it sounds like a relaxer, right? OK well as I read it, it basically stated that you would use the product on your hair and then apply heat and your hair would be straight without having to use a relaxer. Well I had a few concerns, first of all, why does the kit come with gloves? Why do I need gloves to apply this product to my hair, sounds like a chemical to me. Secondly this straightened look will last throguh roughly two to three washes. Still sounds like a relaxer, right? Thirdly, it comes in maximum and mild strength. All of this screamed mild relaxer, but the box says it's a heat activated treatment. What's a gal to think? This product costs $19.99 and if you want to see the ingredients, I did the best that I could using my camera phone, so please scroll down to see the ingredients. Ingredients- click on the picture to get a better view of the ingredients. If you've tried this product, please leave your experience in the comment section below. What do you all make of this product? Maybe I'm a little too eager but I have my Black Friday list ready to go. If you're interested check my list below. Also please tell me about the Black Friday list that you have in your mind...what do you need/ want. Darcy's Botanicals deep conditioner and some leave in conditioner (both scented in peach) and maybe the Madagascar hair cream. Karens Body Beautiful Luscious locks conditioner, leave in conditioner and hopefully some of her products she has been sampling will be available in the full size. That's about it for me...sooooo what do you want? This morning I woke up and read an email from a blogger (her latest blogging venture is under the name We Live Style) who has been reading my posts for some time now. In fact, she remembered my blog back when I used to post weekly. Get a load of that, for all of you newbies to my blog, yes, there was a time when I produced weekly and dare I say it DAILY posts. Now I'm fortunate if I am able to pump out a few posts a month, and that saddens me because I have tons of things I would like to discuss. But alas too many things get in the way and prevent me from getting done the things that bring me enjoyment. Now don't get me wrong, I am not some drone just working 24/7 without ever taking a break, but I am a gal who prioritizes and yes my 9-5 career takes precedence. Coincidentally, I read an article from Forbes yesterday, which was retweeted by T from the blog Tea and Such and it discussed women burning out by age 30 primarily because of the ways in which we may overextend ourselves for the JOB. It mentioned that our professional male counterparts take more breaks on the job just to relax, along with a host of other "this job won't stress me out" exercises. Along with the job and other things that we all have to do I sat there thinking am I reeking of singed fabric from my burn out without even knowing it? Go on, take a whiff could my lack of daily blogs be an indication that I too have experienced a burn out? Well today I exhale because for the last two days I have done something which I had not done in a long while- I went to bed early!!!!! Which in turn has allowed me to create a blog post for you this morning 6:38 am, but I feel good- very good. Perhaps this is a new day- heyyyyy. What do you do to prevent the job and anything else in your life from burning you out? I'm wearing a combination of Trxie from Zoya and Gone Gonzo from the OPI (the Muppet collection). Both polishes will be featured in my vlog for this week. 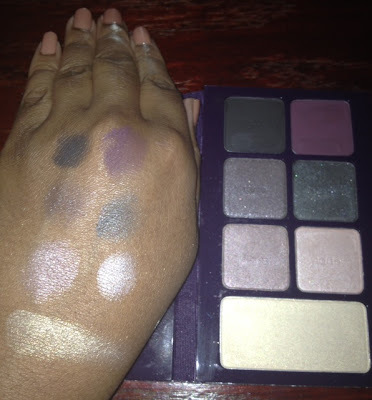 I just wanted to post my latest videos which features, Zoya, Tarte, Bliss and more. Here is the Sephora Friends and Family Code which ends 11-2-11 click here to get your code. Here is my What's New This Week Video which features Inglot cosmetics, the new Mac Sultry Snowglobe palette a fabulous makeup remover from Urban decay and much more. The video below features my review of the Ori Organics Curl Restorative Masque. 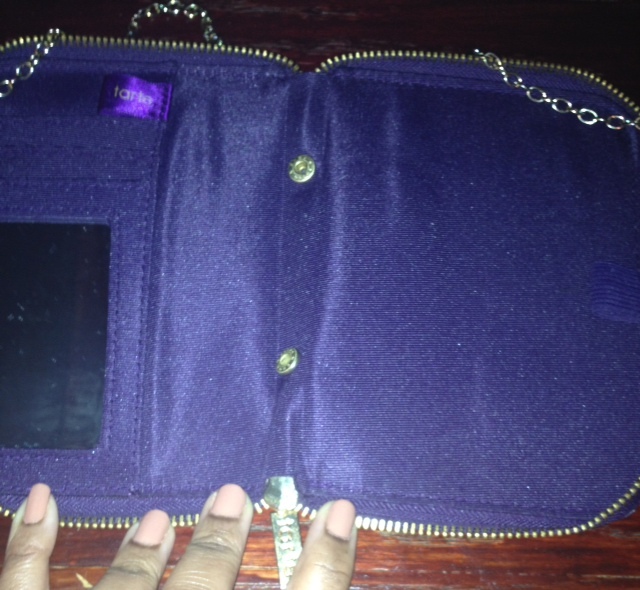 I also show a few cosmetic swatches from Kissable Couture. Have you tried this product or any other products from the Ori Organics line? If so, please tell me about your experience. Not too many years ago I was a curling iron junkie. I would whip out the curling iron in a second to wrangle my hair into submission. Over time, my hair became more and more lifeless until I banned heat from my hair almost entirely. At the time, I thought all heat styling tools would cause damage, so I released the heat and found other styling alternatives. What I have come to realize is that there are tools that can allow you to style your hair without making it look like dried out limp noodles. Sultra, the uber famous brand of heat styling tools, specially designs their flat irons to ensure that your hair is protected. By using kyocera ceramic plates, the Sultra Wicked Gold Decadence Wave & Straight flat iron is able to provide consistent and constant heat throughout the plates as you style your hair. 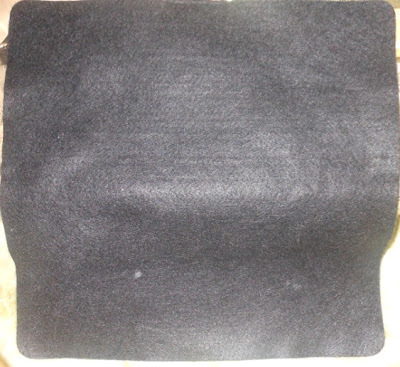 Sultra also claims that the infrared rays are able to seal the cuticles of your hair strands. 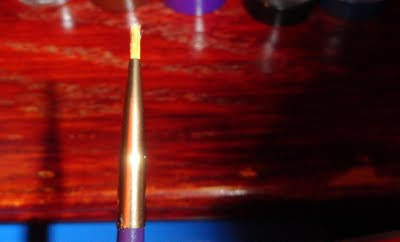 When I did use this tool on all of my hair, it looked silky straight without any prickly ends standing at attention so that may be an indication that my hair strands were in a more relaxed state ( I hope that makes sense). Here is a picture from the box showing what your hair may look like before and after using the flat iron if you have damaged cuticles. I was surprised and to be honest a little nervous when I discovered that there is no way to regulate the heat on the flat iron. 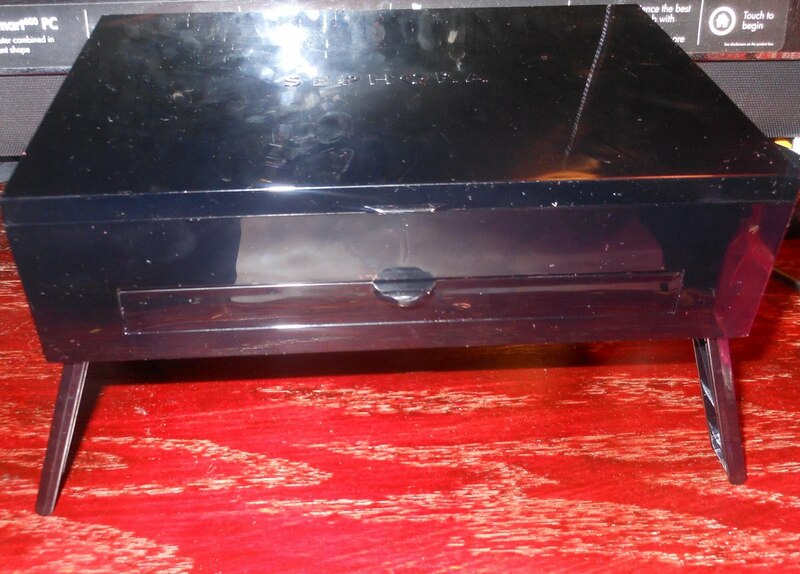 It heats up to 375 degrees and you simply can not control that aspect of the device. On the other hand, the ceramic plates make for an even distribution of the heat, I also had to keep in mind that this is a one pass flat iron. Some irons may feature temperature controls and some people turn it down to a temperature lower than 375 but I have seen those same people ( on youtube) pass over a section of hair numerous times. So when you balance it all out, a single pass at 375 may be comparable or even better than a lower setting that requires a number of passes over your hair. For those of you who use flat irons, what temperature setting do you use? While flat ironing my hair, I didn't attempt to get curls or a wavy pattern, I simply wanted to straighten my hair. I know some of you are mumbling...."doesn't she have a relaxer?" The answer is yes, however my hair flat ironed looks different from my heat free tresses under normal conditions. I don't usually use any heat on my hair so especially after air drying my hair, looks beyond poofy. I don't mind looking like a lioness so I just work with what I have, but there are times when I want clearly defined parts in my hair depending on the style that I've created. Also I may go months and months between relaxers, so as my roots are growing out I have a large amount of chemical free hair that I can't treat in the same manner in which I would treat my relaxed hair. I have to admit that when using the wicked gold flat iron I thought if I decided to go even longer between relaxers or completely transition, this flat iron could prove to be an essential part of my transition. My hair was shiny for roughly 3 days but the straight and silky feeling lasted all week long. I flat ironed my hair but then I used my standard magnetic rollers to further style my hair, my hair was very straight so I found that my curls were not as tight as they usually are but that actually makes sense. This leads me to believe that if I would have used the iron to get waves or curls it would have similarly left my hair with waves and curls that would stay in place. However, since I straightened my hair only, it did it's best to maintain the straight look. What I was most impressed with is the fact that my hair was never crunchy or brittle. I did't get any weird scents like I was burning my hair. The obsessive part of my being caused me to hold my hair up to the light to see if any split ends emerged after my flat ironing experience and I am please to report that my hair appeared to have remained the same. 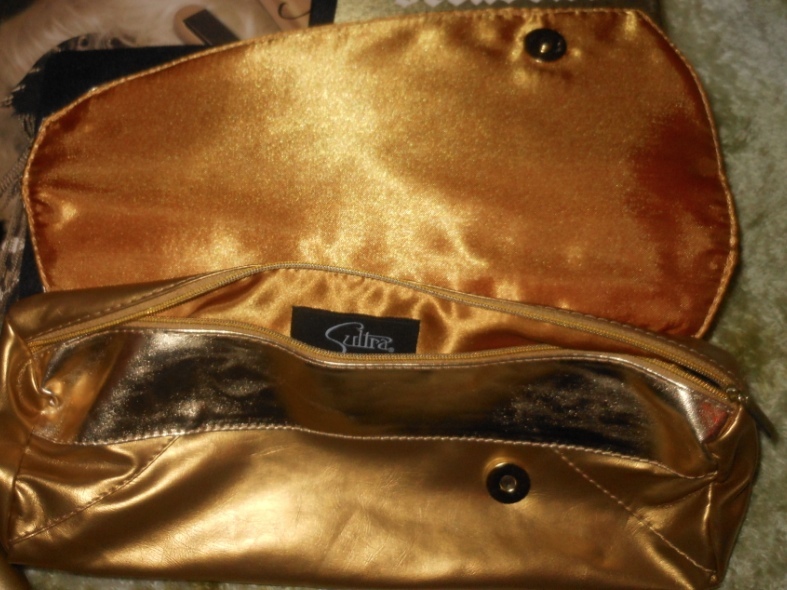 You will receive a gold clutch- like heat resistant pouch for your iron which is perfect for traveling or easy storage at home. 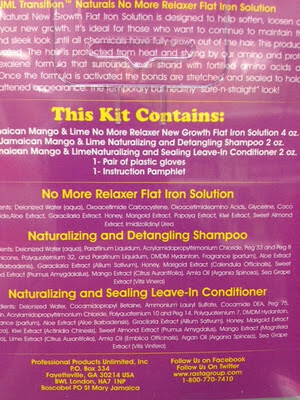 You also get a complimentary heat resistant cloth that you can place on counter tops as you are flat ironing your hair. 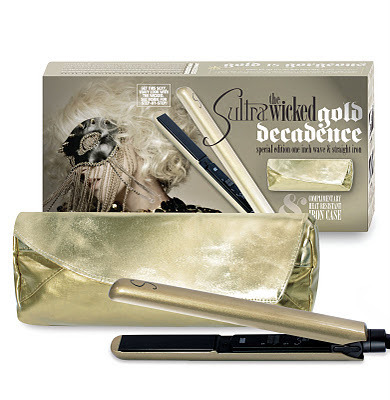 Currently this iron is available in pink and black but as of November 1st you can get your own limited edition Wicked GOLD Decadence Wave & Straight flat iron from Sultra. 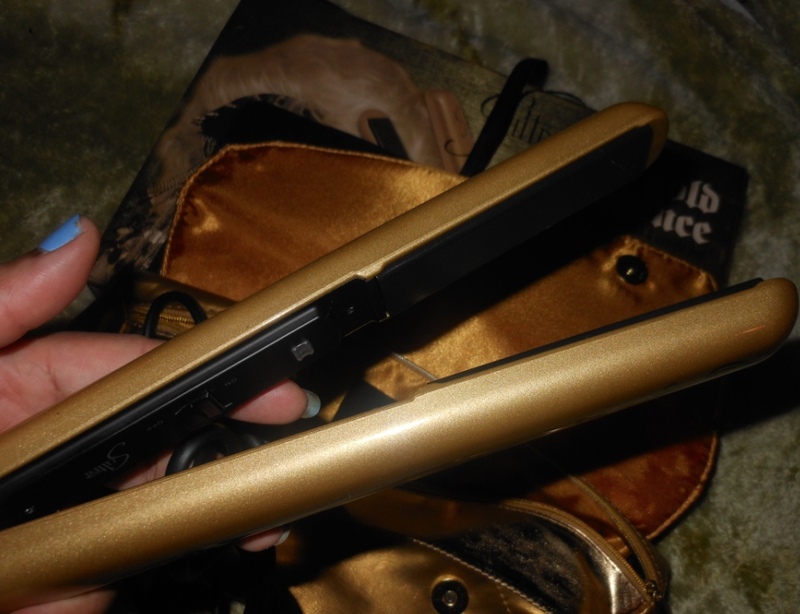 This $165 flat iron can be found directly through the Sultra's site . You can also purchase Sultra products through Sephora and other retailers, but I am not certain that they will have this chic limited edition gold flat iron. Although I won't use heat daily I have to say that my interest has been piqued and I am no longer scared of using the proper heat styling tools to achieve a specific look. If I can ever get my sister to agree to let me flat iron her natural 4a/b hair then I will certainly post the results. Below is a video that basically reviews the iron. There is a brief demo at the end of the video showcasing the iron in action on my hair. Have you used Sultra products? If so please let me know about your experience. 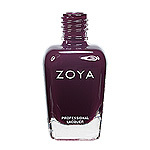 Zoya is having a BOGO sale (click here)- buy one bottle of polish and get another one free. Limit( 2 bottles)- this means you will get 4 bottles of polish. This sale ends today 10/5/11 at 11:59 pm EST. I have seen all of the exciting nail designs that people have been sporting recently and I even got in on the crackle craze. While the crackle polish helped me to achieve a unique look, I found that you had to find the right combination of base coat and crackle to achieve a look that didn't make your nails look like you were wearing 14 day old nail polish. Needless to say, I needed a new look for my nails, but I knew creating cute looks with a nail design pen would be out of the question. 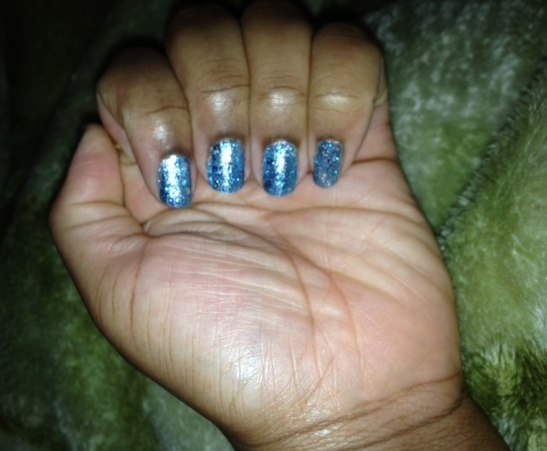 So my shaky hands prevented me from showing off my own nail swag. 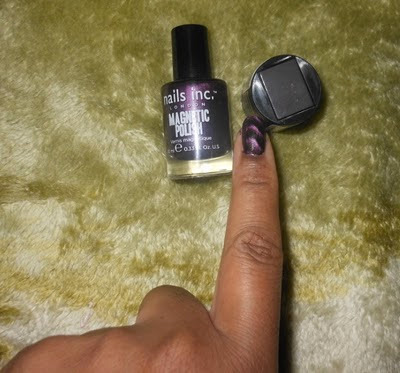 In a recent video (video part 3), I shared my review of the lackluster holographic polish produced by the company Nails Inc. London, so when I saw their magnetic polish I was beyond skeptical. 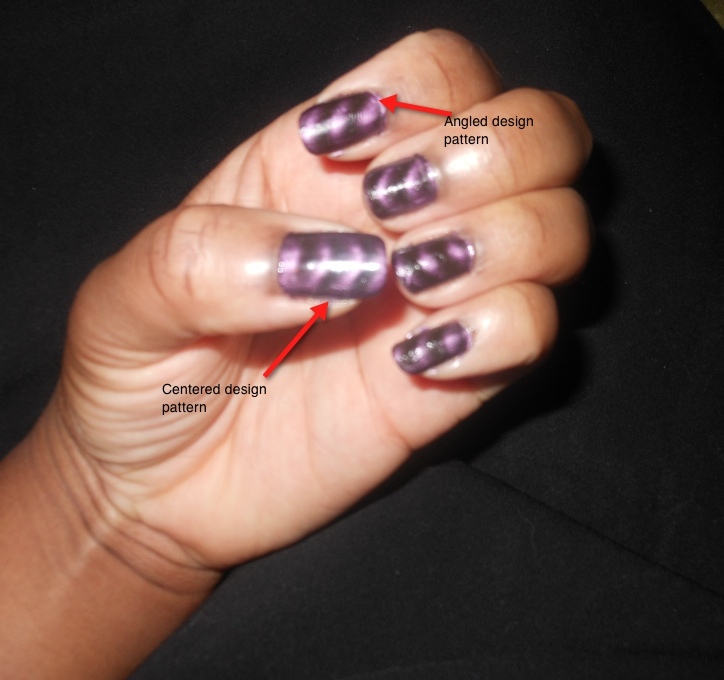 This magnetic polish is supposed to give you a special effect on your nails by allowing a magnet to do all of the hard work. No need to use a nail design pen or any other tools to create a neat professional looking nail design. Thanks to the $16 magnetic polish all you need is the polish itself and the accompanying magnetic cap. Available in three colors, purple, silver and gold, I decided to give the purple a shot. The nail polish actually has two caps, one that closes the polish bottle and the outer cap which features the cuticle ridge and magnet. See the complete package below. I was moving the cap a bit while it was over my index finger and the design came out on an angle. I held the cap steady over my thumb and I got this perfectly centered chevron like design. This lets me know that if I want to get really fancy, I may want to try a little wiggly motion over my nails to see if I get a varied look. 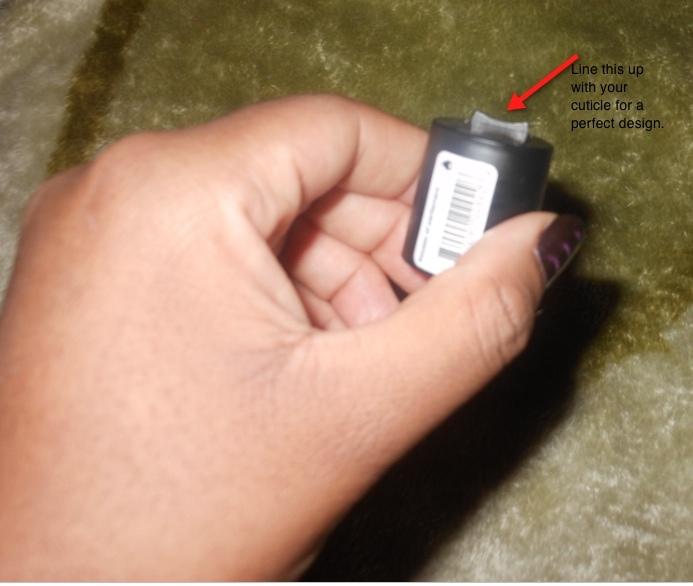 Don't put the magnet too close to your nails or you will watch the polish lift up and adhere to the magnet. Even though the polish can be easily cleaned off of the magnet you will undoubtedly smudge your nails in the process. Practice will make perfect until you figure out the perfect magnet to nail distance. 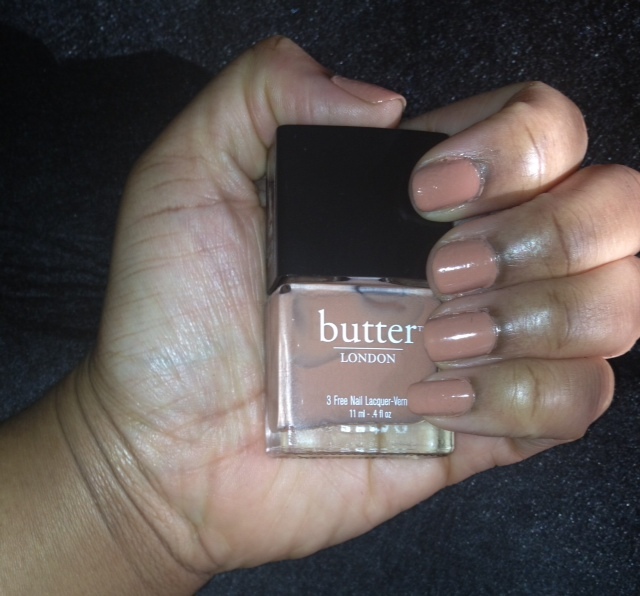 This polish does what it says and after applying a top coat it really did look like a professional job. In the pictures please note that the smudges are due to falling asleep not long after my final application. Thanks to Nails Inc London I have been able to breathe new life into what was my dying nail swag game. 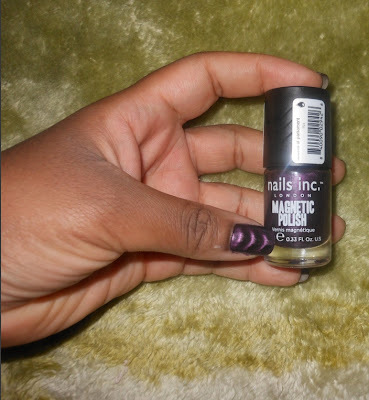 You may also like to know that some of the Nail Inc polishes are paraben free. 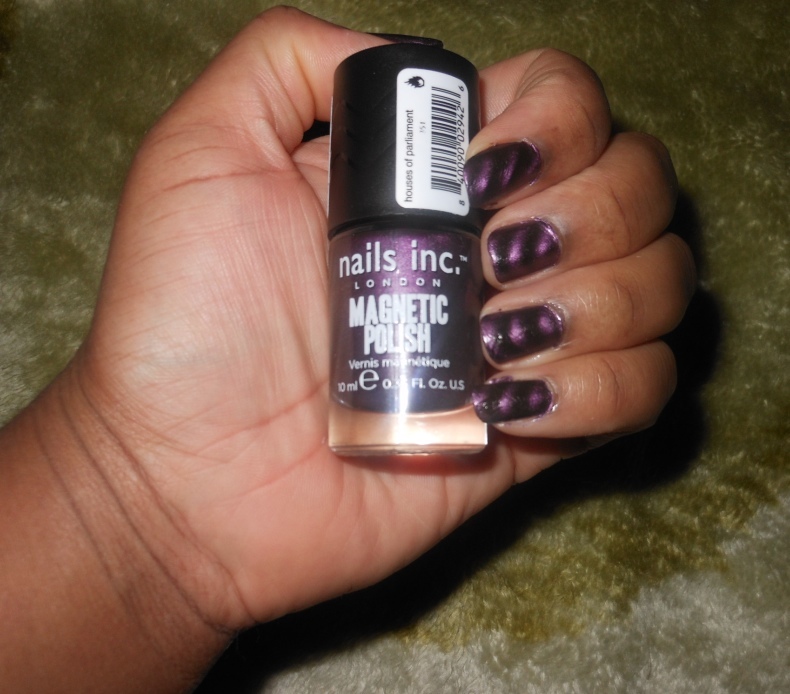 It didn't specifically state that about these magnetic polishes but I certainly didn't see any parabens on the list of ingredients. UPDATE- This polish lasted for 8 days on my nails- I only took it off because I was tired of it looking at it....lol. I will likely demonstrate the use of this polish in my next video. I picked this up from Sephora but you can also purchase it directly from the Nails Inc London site. I hope you're doing every well. I recorded a large amount of footage so I am still editing, everything will be uploaded by the end of the day but I can at least start you off with part 1. This video features a little bit of MAKEUP- I know....PJD doing a makeup post instead of hair...lol. 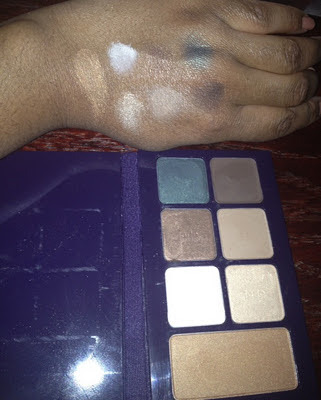 Anyway, in the video I show you a few things that I couldn't show you on my text based makeup post on the latest Sephora kit. I also discuss some Makeup Forever products that I picked up. Yes, hair products will be shown as well. :-) Also this is not just a haul video, I will do two mini reviews (NYC lip stain and the Hair Pomade from Oyin). 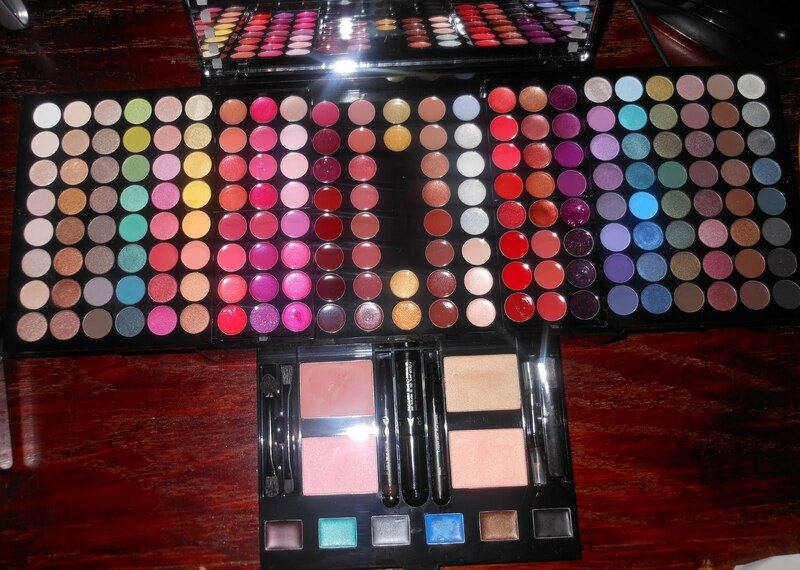 you will also get some nail polish and makeup swatches! 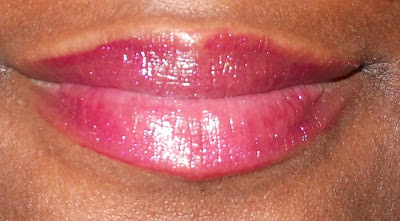 I just learned that Kissable Couture is offering their new lip gloss in the shade Glamour for free! You only need to pay the shipping if you are one of the first 100 customers- 1 per household. Also if you would like to get any of their other glosses for roughly $9.50 use the code September7. Tomorrow is the release of the film Contagion, a movie about a disease that rips through the nation. Although she isn't featured in any of the movie trailers I have seen, Sanaa Lathan is in this movie. She apparently has a small role as the wife of Laurence Fishburn's character. Will you check out Contagion? Once you look past the bad lighting and dust particles, you will notice the latest Sephora makeup kit in the picture above. Here is another picture of the case with the legs of the case collapsed. The latest kit will be released in October but Sephora provided Sephora VIB members with exclusive access to tihs kit about two- three weeks ago for a limited time. I hope this review will help you to decide if this kit will be worth your $49 in October. 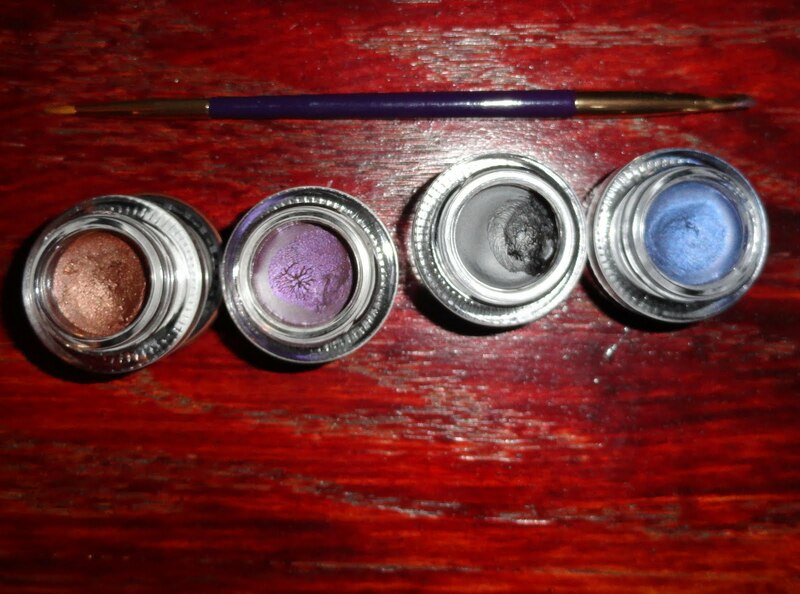 Take a closer look at the eyeshadows, blushes, and bronzer. 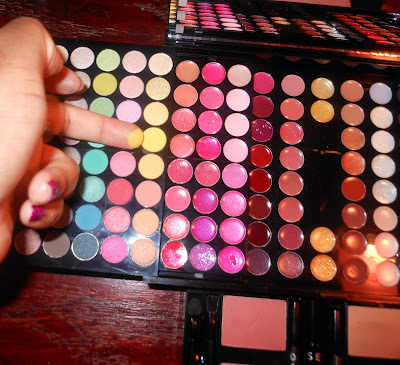 The eyeshadow trays slide out to reveal 84 lip glosses as shown in the picture above. Take a look as I swatch the blue and a yellow eyeshadow. Some of the eyeshadows are really pigmented while others well- not so much. 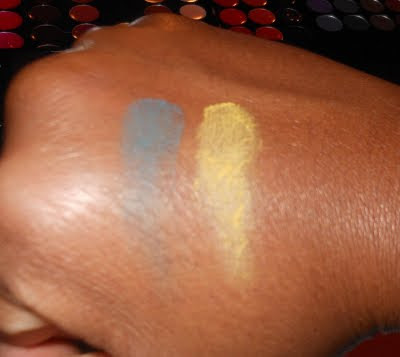 I think some of the colors, like the yellow, look really bright in the palette but then once it's on your face it rubs of way too easily and it's too light. 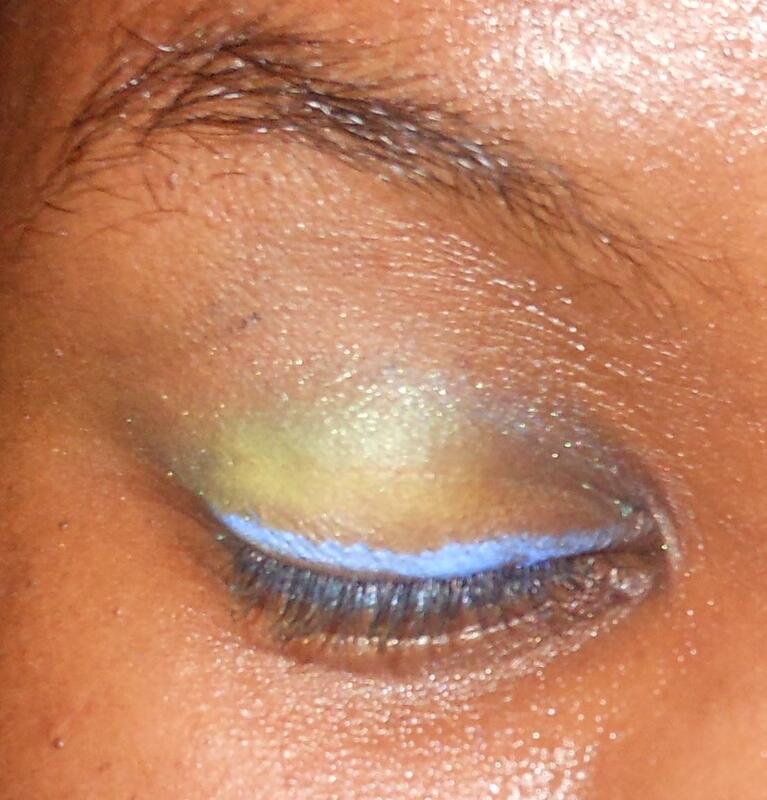 Here is a yellow/ green / blue look that I tried on my eye. Notice how you barely see the other colors, and I put on a good amount of yellow to get it to even show up as much as it did on my eye. 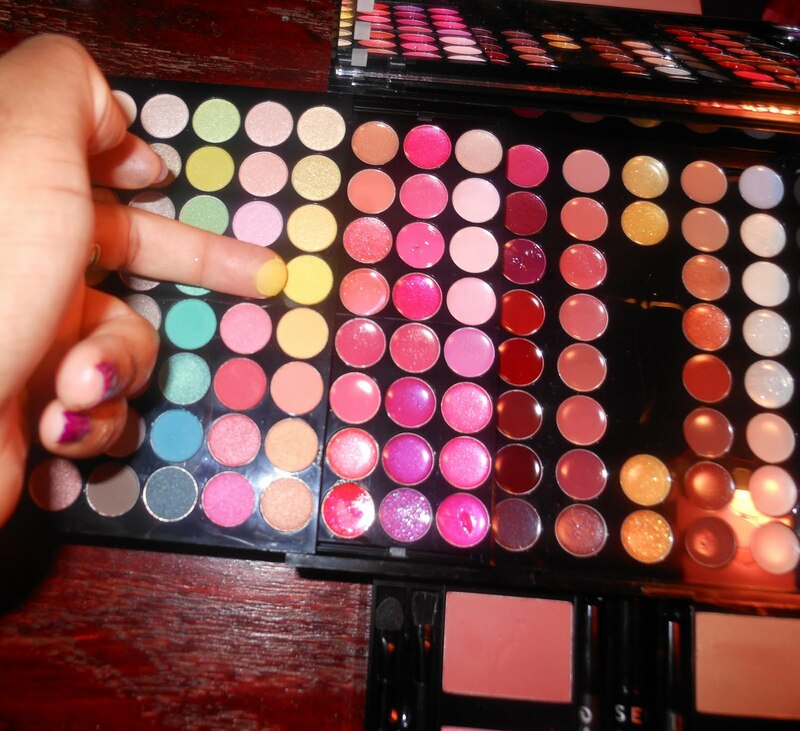 You barely even see the other colors on my eye so that was a bit frustrating. I didn't have on a base because I wanted to see what the colors would look like alone. You can ignore the light blue liquid liner on my eye, it is also a Sephora product but it didn't come with the kit so I will discuss that in another post. 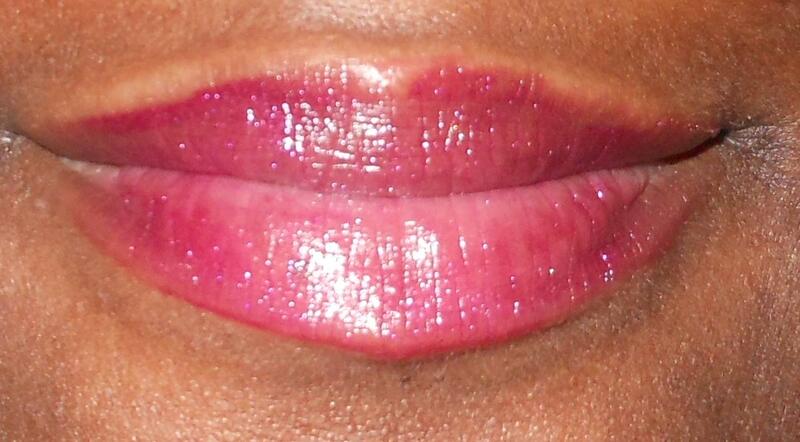 (the one that has some purple drippings outside of the circle) then look at my lips you will see how well it applies. This lip gloss formula is not sticky so that's an added bonus. 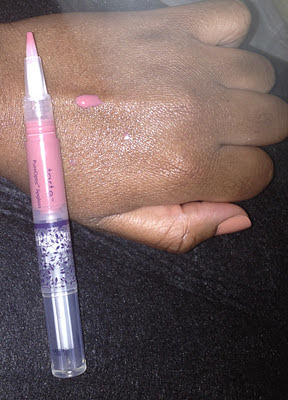 On a sticky scale of 1-10 (10 being the stickiest), this lip gloss weighs in at about a 2. The mascara seems a bit dry, the cream liners seem to apply better on my fingers than my eyes. The pencil liners are basic, they get the job done but not in a smooth way. 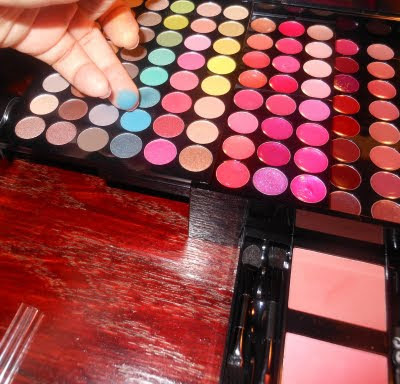 Overall you get enough lip gloss colors to keep yourself busy for a while. 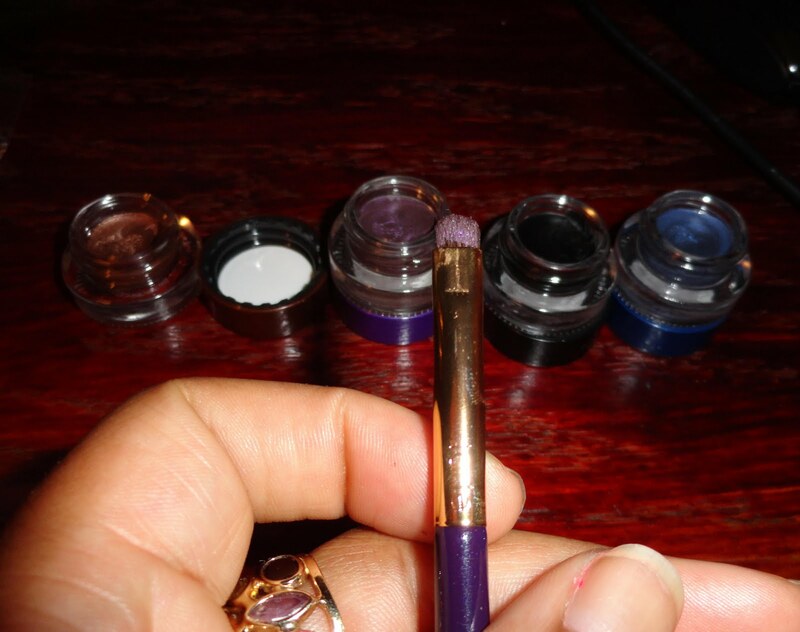 If you are interested more in the eyeshadows I say try another kit. 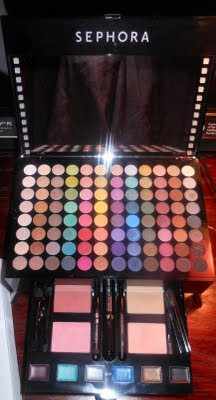 However, if you are just getting your feet wet and you want many different colors without investing in expensive palettes then feel free to pick this one up. Since I only paid $49 I won't cry about it too much especially because I snagged so many glosses out of this deal, but the eyeshadow are simply weak- they look better in the palette than on my lids. 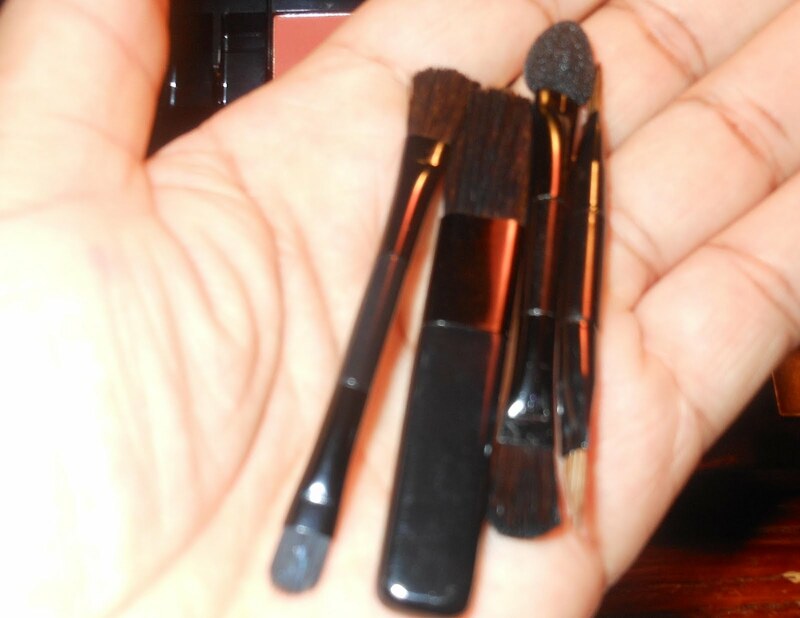 Were you one of the early birds who picked up this Sephora kit? 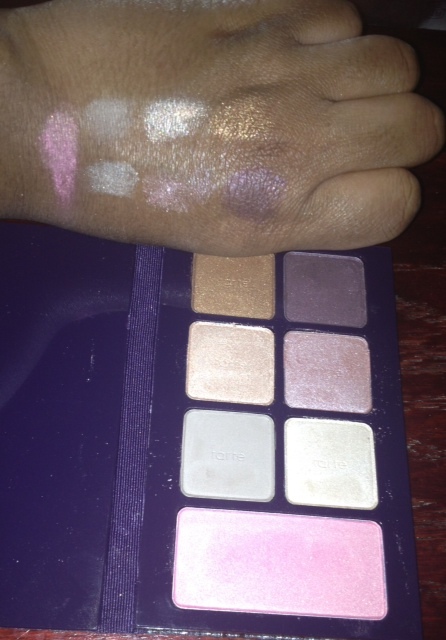 What is your favorite eyeshadow brand? For now, the title of this post may be a bit misleading because only one sale is listed below. However, as I am made aware of labor day specials, I will post them below! Please feel free to post sales that you are aware of in the comment section. I will not do any major shopping until Black Friday but for all of you ready to spend a little cash Happy Shopping!!!! All sales end on Monday unless otherwise stated. 1) Komaza Care will give you 15% off your entire order if you use the code LABOR. You have until Friday to take advantage of this office. 2) Aerosoles 15% off everything now through 9/5/11 no code needed for online purchases. 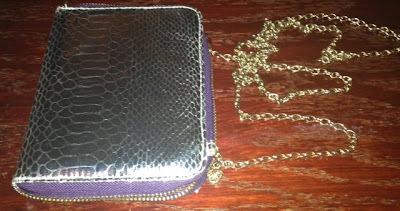 3) Dooney & Bourke an additional 30% off sale merchandise now through 9/5/11 select stores only. (you will have to check your local D&B store). 5) J Jill will give you 30% off sale and outlet items. End 9/5/11. Here is my review on two Bear Fruit Hair products, Cherry Bark Creme Leave-in and the Banana Avocado Deep Mask. If you have not heard about this company, please check them out here. If you have tried their paraben free goodies, what are your thoughts? Thanks to the makers of BFH for sending me these products for review. I hope you are all well. I was on a mini vacay but I am back!!! This means that I will be posting reviews very very soon.